This entry was posted in fake news, Media, MSM and tagged Donna Brazile, FoxNews Betrays America, JOB AT FOX NEWS, PRO-HILLARY, WND. Bookmark the permalink. Fox News does not do any independent investigations like One American News does. They are the (K) controlled opposition “news” platform. I have caught them numerous times “lying”. On the other hand, they do and have exposed the treasonous cabal trying to overthrow our elected government of President Trump. Fox News prides itself on ‘fair and balanced reporting.’ Did it ever occur to you that maybe hiring this woman is an effort to provide that balance? After all, if we don’t hear what the other side has to say, how can we rebut their arguments? Yielding to demands from CAIR, ‘Fair and balanced’ Fox News also fired Judge Jeanine Pirro. Im shocked too. I love Judge Jeanine. We dont have many voices out there in the MSM. We keep getting backed into another corner. How many times can you get away with poking a rattlesnake when it wants to be left alone? It comes as no surprise because at least 22% of Fox is owned by some Saudi prince (whose name escapes me right now). On the other hand, has anyone ever noticed that the Clinton Administration had a whole collection of people who looked, physically, JUST PLAIN WEIRD??? 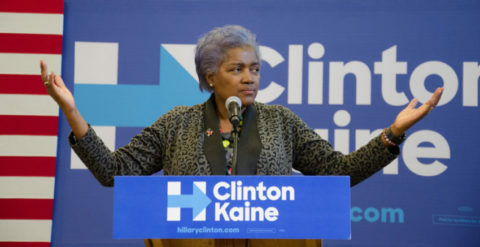 Donna Brazile—where is she from, Andromeda??? Lachlan, Rupert Murdoch’s son has taken over Fox. Seems like Fair and Balance is wobbly after Janine Piro Saturday’s 9 pm went on the chopping block. Shepard Smith, a very anti-Trump 3 pm block is competing with the evening block, Tucker Carlson, Shawn Hannity, Laura Ingraham and Shannon Bream. And now that the welcome Matt has been “securely” placed for Dona Brazil we will see a “moderate” Fox channel join the other networks. It was bound to happen, little by little the left is crawling at a turtles’s pace and getting there. I don’t watch TV news anymore – not even FNC. Half the people at Fox are liberals as it is.